In a blow to Western Australia’s flagship tourism event, the Red Bull Air Race has been cancelled worldwide. The organising body has axed all stages of the global event for 2011, citing new safety measures and "headquarters" restructure. 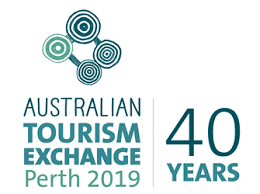 The chairwoman of Tourism WA, Kate Lamont, said she believes the event has been cancelled due to the global financial crisis. The race suffered its first ever crash in Perth this year, when Brazilian pilot Adilson Kindlemann plunged into the Swan River during a practice run. The race was first held in Perth in 2006. This year's race saw more than 300,000 spectators during the two-day event. In 2010 races were held in major cities worldwide, including New York, Rio de Janeiro, Barcelona, Hungary and Abu Dhabi, but the final event of the season, in Portugal on September 4 and 5, has been cancelled after organisers said they failed to reach an agreement with Tourism Portugal. Finalists for the 2010 HM Awards for Hotel & Accommodation Excellence presented by Sealy have been announced, with all thoughts now firmly set on the gala dinner to be held in Sydney on September 3. A record 1200 entries were received in 2010 and following hours of voting by over 20 judges, the finalists have been announced for 38 of the 42 categories to be awarded this year. The four biggest gongs at the HM Awards – Hotel Brand of the Year, Accommodation Chain of the Year, Overall Accommodation Property of the Year and the HM Magazine Hotelier of the Year – have been decided by the region’s leading CEOs and the finalists for these categories will be announced at the gala presentation dinner. The 2010 HM Awards are hosted by HM magazine, presented by Sealy and co-hosted by AHS Hospitality, Intrust Super, ISIS and Philips. The 2010 HM Awards gala presentation dinner is being held at Sydney’s Doltone House on September 3. Figures released this week by Tourism Fiji show more than 21,203 Australians visited the destination in May 2010, an increase of 42.9 percent over the figure recorded for the same period in 2009. The May result brings Australian numbers for the first five months of this year to 99,633, a massive 42.8 per cent increase over the 69,787 figure recorded for the same period in 2009. Tourism Fiji regional director Australia Paresh Pant said the 21,203 figure for May represented an increase of 6375 visitors over the 14,828 recorded for the same period in 2009, in the process eclipsing all previous Tourism Fiji records set for the month. More to the point, he said, the continuing success the destination is enjoying from the Australian market means that Australian business to Fiji overall now constitutes more than 46 per cent of the destination's total visitor intake. The strong Australian result helped take Fiji's international visitor tally to 216,525 for the five month period, the figure smashing the 2009 result of 177,067 by 22.3 per cent. "The Australian performance is playing a major role in keeping Fiji bang on track for its best ever year," he said. "If this trend continues across our peak season (June-August), we are optimistic Fiji's international visitor intake will surpass the 600,000 'best ever visitor' target we set ourselves last year." Fiji's best figures were achieved in 2008 when the destination recorded a total of 582, 602 international visitors for the 12 month period. Figures from other source markets also continued to improve with US figures up 24.5 per cent, Japan figures up 34 per cent, South Korea figures up by 21.5 per cent, Canada figures up by 14 per cent, EEC figures up by seven per cent and New Zealand figures up by three percent. 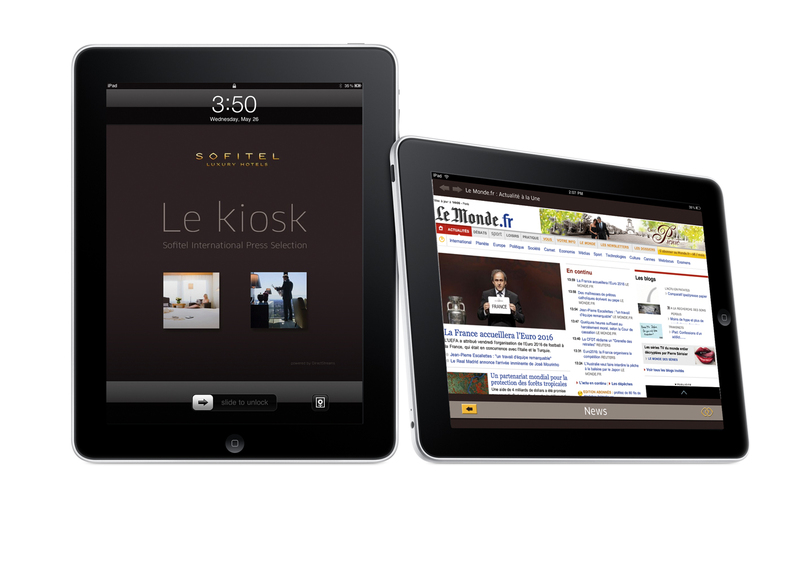 SOFITEL LAUNCHES ITS IPAD APPLICATION - "THE KIOSK"
Following in the wake of the European launch of Apple's iPad, the Sofitel Luxury Hotels brand is launching its own iPad application called "The Kiosk." "The Kiosk" serves as an interactive press review, offering a selection of daily newspapers and magazines on economics, sports, fashion and lifestyle. Guests staying in the most prestigious Sofitel suites and locations in four major European cities – Paris, London, Munich and Brussels – are provided with iPads during their stay. The application allows guests to choose from a selection of 6 newspapers and magazines for each of the 6 selected countries: France, the United Kingdom, Germany, Spain, Italy and the United States. Le Monde, The Wall Street Journal, El Pais, The Financial Times, Die Welt, Vogue and l'Officiel, French fashion magazine with unique archives dating back to 1920… are just some of the titles available for easy browsing by users. The iPad is a trendy, practical and environmentally friendly way to keep abreast of current events, fashion or sports results while enjoying an exceptional reading experience on the device's high-resolution screen with LED backlighting. Eventually, the brand intends to enhance its offering by providing press selections from more countries and expanding the service across its entire network worldwide for guests in its most prestigious suites. Finally, new services will gradually be added to the application to meet the constantly changing needs of its international clientele. Indonesian carrier Batavia Air has announced the commencement of its first services to Australia, with daily flights between Denpasar and Perth. The airline says a new bilateral agreement concluded this month between Indonesia and Australia has allocated an additional 4000 seats per week from each country, allowing Batavia to service Perth "and then Sydney and Melbourne". Batavia said it will operate A319 flights to Perth, and a brand new A330-200 for Sydney and Melbourne. More information in today's Travel Daily. The World Heritage Exhibition Centre will be launched today (Saturday, 24th July) at Mount Tomah Botanic Garden featuring sweeping panoramic views of the Greater Blue Mountains World Heritage Area and surrounded by a world class collection of plants. Iconic Australian actor and passionate environmentalist Jack Thompson AM, and retiring Member for Macquarie Bob Debus MP will officially open the magnificent centre (see details below). "I encourage people to visit this spectacular Centre at Mount Tomah Botanic Garden," Mr Debus said. "This Exhibition Centre is a superb showcase of the Greater Blue Mountains Area and celebrates the 10th anniversary of the Area's inscription on the UNESCO World Heritage List in 2000 for its outstanding universal values. Importantly, it will also be used to deliver curriculum based lessons to school children relating to National Parks and conservation," he said. Jack Thompson said the spell-binding views as well as an intellectual and artistic experience help deliver a strong conservation message. "The first seed of conservation was planted by Aboriginals who took great care of this natural wonderland. Later European settlers made their mark when Australia's first conservation action group was established in the Greater Blue Mountains," Jack Thompson said. "The Blue Gum Forest Committee saved the Blue Gum Forest in the Grose Valley from being developed by a leaseholder into a walnut farm. Despite the depression they raised enough money to buy the lease and then gave the forest back to the public. Their success became a symbol for future community environmental campaigns," he said. Botanic Gardens Trust Executive Director, Dr Tim Entwisle said like Jack Thompson, the World Heritage Exhibition Centre will become an Australian icon. "The awe inspiring vista from the Centre will transport visitors into another realm, where the area's history, culture, geography, animals and of course its flora rule," Dr Entwisle said. Mount Tomah Director Rob Smith added "this beautiful and sustainable new building provides a space where kids from 4 to 94 can play in a virtual world of canyons, touch diverse forms of gum trees, wander through a slot canyon without getting their feet wet, and in a full surround sound theatre experience a journey through the gigantic cliffs of the 1,000,000 hectares of wilderness and National Park landscapes that make up the Greater Blue Mountains World Heritage Area." They can also get close to Silurian fossils from Jenolan caves or see fantastic ceramic gumnuts from Blue Mountains Artist Heather Jones. Mr Smith said "The Centre gives the botanic garden visitor a 21st Century journey through these ancient landscapes as the world class Mount Tomah Botanic Garden becomes a gateway for the surrounding seven National Parks and the Jenolan Caves Karst Conservation Reserve that make up the Greater Blue Mountains World Heritage Area." LAN is continuing its expansion within South America, announcing plans for new nonstop flights between two of the most popular destinations, the city of Lima, Peru, and Iguazu in Argentina, gateway to the breathtaking Iguazu Falls. Subject to regulatory approvals, LAN Peru will introduce four weekly flights between Lima and Iguazu, commencing in January 2011. A UNESCO World Heritage attraction, Iguazu Falls are located at the junction of the Iguazu and Parara Rivers, on the border of Argentina and Brazil. Depending upon the water flow, Iguazu features as many as 270 waterfalls, the tallest of which is approximately 80 metres high – more than Niagara Falls on the US-Canada border. 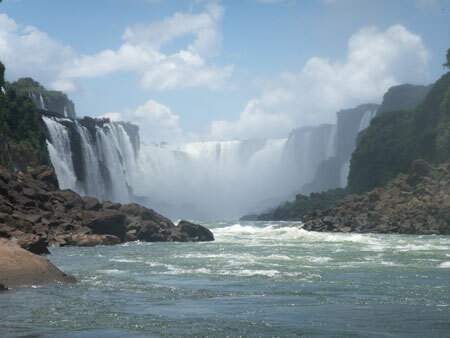 Created by a geological fault some 200,000 years ago, the Iguazu Falls were first seen by Spanish explorers in 1541. Today, not only are they a major tourism drawcard for daylight and even full moon visits. Since 1991, the Iguazu Falls have also helped to power the huge Itaipu hydro electricity plant, which provides up to 40 per cent of the electricity needs of Argentina and Brazil. The proposed Lima – Iguazu route is the latest in a series of new services by the LAN group of airlines, with LAN Airlines due to start Lima – Easter Island flights from January, LAN Ecuador starting flights from Quito to Galapagos Islands from November, and new Lima – San Francisco services commencing this month. LAN also is extending its current European services with a new onward flight from Madrid to Paris. For the third consecutive year, LAN recently was named "Best Airline – South America" in the global Skytrax Awards for airline excellence. From Australia, LAN – a member of the global oneworld airline alliance - offers six weekly Airbus A340-300 flights to Santiago, Chile, via Auckland, New Zealand, with onward connections to destinations throughout South America. For more information, or to make a flight booking, visit www.lan.com, contact travel agents or call LAN reservations in Sydney on 1800 221 572. Simon Harper – General Manager Mercure Hotel Nadi and Vicki Lee – CEO Cure Kids. FIJI Water (Natural Waters of Viti Ltd NWVL) is once again spreading their commitment to the community with a generous FJ$30,000+ contribution to the 2010 Accor Extreme Challenge to Cure Kids. This donation follows on from the FJ$90,000 that was donated by the Fiji Water Foundation last year which helped fund the Rheumatic Heart Disease screening programme. The bi-annual adventure challenge held by international hotel company Accor in support of Cure Kids Fiji this year also includes an 'Extreme Makeover' to Nadi Hospital's maternity ward. It was this life-saving aspect of the competition that secured Fiji Water's involvement in the iconic race to improve the odds for the children of Fiji. Paul Davies, Managing Director of NWVL, says the opportunity to contribute towards the transformation of the ward, and help keep mothers and babies healthy in the first critical days, is a natural fit with the company's community support. NWVL has great admiration for the work that Cure Kids and Accor do in Fiji. Their ability to develop and manage projects along with NWVL's ability to co-fund and support this event is a perfect partnership. "Any positive change we can make by investing in our community is returned to us ten-fold through the positive results we see in the development and better health of the Fijian people – it's a fun and extremely rewarding way to get involved in the community," says Davies. 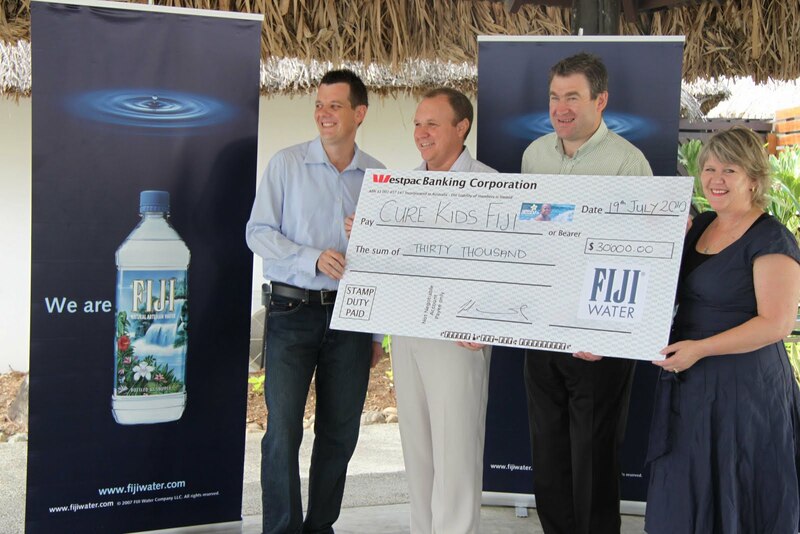 Fiji Water's contribution of FJ$30,000 towards the Cure Kids fundraising event is a cash donation. They will also transport kayaks from New Zealand, through the services of their sister company Neptune Shipping, provide in-country logistics support with their trucking fleet and, of course, FIJI Water to quench the thirst of the 34 Accor Hotels teams involved in the event during 28 – 31 August. Vicki Lee, CEO of Cure Kids, says FIJI Water's contribution to the maternity ward and the event further emphasises the company's belief in community well-being, and supports the ongoing work and investment that Accor Hotels provides Cure Kids in Fiji. "I think it's wonderful that with partnerships with local companies like FIJI Water we are improving the odds for local children. The more equipment and essential research we can all provide with funds raised from these events, the better for future generations of Fijian children," says Lee. In Fiji, together with Accor and a myriad of wonderful partners Cure Kids is working to improve the odds for the children of Fiji. Through this partnership Cure Kids Fiji is funding basic, life-saving medicines and equipment. Children are a precious part of the Fijian culture and lifestyle. Yet sadly, far too many lose their lives to basic illnesses that are treatable and preventable in other parts of the world. I flew into Bangkok for a brief visit last week, a trip that included a thank-you dinner for hundreds of overseas travel agents and media who were winding down from a mega fam trip. It was here that I chatted to 92-year-old Kusa Panyarachun, managing director of World Travel Services in Bangkok, and senior president of the Tourism Council of Thailand. Khun Kusa is a sprightly, neat figure in an expensive suit who attributes his longevity to the family genes, regular exercise and, he told me, “a few glasses of Australian Penfolds red wine each night”. Educated in the United States, he served as a paratrooper in the US Army before returning to Thailand to build up the family travel business, pretty much from scratch. His youngest brother was once prime minister of Thailand. “I still go to work every day and I work very hard,” he said proudly. During the recent political turmoil in Bangkok, which tourism people here guardedly refer to as “the incident”, the sudden downturn in business forced Khun Kusa to consider laying off many of his 600 staff. Instead he cut everyone’s wages by 25 percent but did not sack a single worker. “Now business is a little better and I am cutting pay only by 10 percent,” he said. I asked him how long it would take for business to return to pre-incident levels. Khun Kusa held out both hands in front of his chest and crossed his fingers. Much of Bangkok appears to have its fingers crossed at the moment, including the bar girls as they try to drum up dwindling business. Over lunch, the sales and marketing director of a Thai resort told me that the bars were operating as best they could while Bangkok is still under a state of emergency. That’s Bangkok. It’s doing it tough but it won’t give in. Luxury responsible tourism company, &Beyond, has launched its Private Journey Hosts, experienced guides who lead guests on exhilarating adventures to South Africa, Tanzania and Namibia. All of the expert guides identified to lead these tailormade journeys are previous &Beyond rangers with a wealth of knowledge and expertise. From explaining the local flora and fauna to discovering little known hideaways, &Beyond's Private Journey Hosts will assist guests throughout their journey to ensure a hosted adventure with a difference. Not only will the guides be waiting for guests as they step off their plane, but they will also drive them from destination to destination, sharing stories and fun facts along the way. In addition to making sure all travel arrangements run seamlessly, they can even book guests' preferred restaurants and specialist activities - from tee-off times at golf courses to spa treatments and everything in between. The perfect cross between a much-loved travelling companion, interactive guide book and reliable social secretary, &Beyond's Private Journey Hosts will help their guests plan personalised itineraries, turning their holiday into a journey of discovery from start to finish. Guests can direct the process, telling their guides exactly what they would like to see and do, or leave some of the creativity up to them. The adventure can be as long or short as preferred, and guests can travel on their own or with the entire family. The guides are also pro's at keeping children happily entertained, giving parents a well-deserved break. It's the ideal way to travel — perfect for families, first-time visitors and repeat guests. Speaking to a crowd of Australia’s most influential travel industry stakeholders at the Tourism Futures travel industry event in Brisbane, Totaltravel from Yahoo!7 today announced the launch of its new online travel destination which includes extensive accommodation listings, destination guides and travel reviews from users’ friends and peers. Acquired last year by Yahoo!7, one of Australia’s leading online media publishers, the new Totaltravel site combines the company’s comprehensive listing information together with the technology platform, search functionality, rich content and social aspects of the Yahoo!7 Network. In addition, the site will roll out new search capabilities allowing users to filter search results by accommodation star rating, type of accommodation, recommendations from others, and a “My Travel” function which allows users to track and share where they have been, which destinations are next on their travel wish lists and see where their friends are going. More than three in four Australian business travellers (76 per cent) consider face-to-face meetings the most effective way of running a successful business, according to new research* by Toga Hospitality, owners of Medina Adina Apartment Hotels, Vibe Hotels and Travelodge Hotels, and technology is considered a poor substitute for meeting in person. Despite advances in technology for conferencing services, only one in ten business travellers (11 per cent) find video conferencing superior to traditional face-to-face meetings and only 8 per cent find conducting meetings by telephone more effective. The results also found that around half of all business travellers (49 per cent) conduct meetings in their hotels whilst away on business. The fresh survey has revealed that many organisations still believe they get the best value from investing the time and money into sending employees interstate to engage with clients and customers on a personal level. Despite the cutbacks associated with the 2009 GFC, the average Australian business traveller embarked on up to five overnight trips in the last year. Four out of five of the Australian business travellers surveyed by Toga Hospitality (82 per cent) said they had been away on business in the last six months. "When it comes to business, 'face-time' is invaluable and helps reinforce the all-important relationships that propel businesses forward. While the travel industry has certainly felt the effects of the recent economic downturn, Australian businesses still see the value in sending their team members across the country to see customers," said Rachel Argaman, CEO at Toga Hospitality. "We recognise that regular travel can take its toll on team members, so we ensure that all Toga Hospitality hotels are well-equipped to support business travellers. Our hotels offer businesses centres and meeting zones, as well as laundry services and dining options to help guests relax and feel more at home. Our hotel teams work hard to ensure that visitors on business trips enjoy a comfortable and soothing environment after a long working day," Argaman concluded. *Research conducted in partnership with Galaxy Research. The sample size was 405 respondents and the survey was distributed throughout Australia. QantasLink today celebrated the departure of its first international service, operating from Cairns to Port Moresby this morning. Flight QF191 left Cairns just before 7am and touched down in Port Moresby at 8.35am, heralding the first time Qantas has flown into the Papua New Guinea capital since 2002. QantasLink Executive Manager, Mr Narendra Kumar, said QantasLink was very pleased to offer the new QantasLink Cairns-Port Moresby direct service, initially with a schedule of 12 weekly services. “QantasLink has invested over $600 million since 2006 in a fleet of 21 new Q400 aircraft, and from today, one of these aircraft will be dedicated to the Cairns-Port Moresby route. At a cost of around $30 million for a Q400, this is a significant investment by QantasLink in the Cairns-Port Moresby markets,” he said. Mr Kumar said the Q400 offered a superior flying experience, including larger seats, additional ceiling height and jet-like speed completing the journey between Cairns and Port Moresby in around one hour and 45 minutes. He added that customers would also benefit from the full range of Qantas services such as an inflight food and beverage service, lounge access for eligible members and seamless baggage transfer and connection to other Qantas destinations. - daily weekend flights offering an early morning departure and late afternoon return. QantasLink is Australia’s largest regional airline, operating about 1900 flights each week to 55 regional and metropolitan destinations. The highly anticipated opening of Banyan Tree Samui has arrived, and the resort is ready to welcome its first paying guests starting 1 July 2010. Guests making their way to the Thai island of Koh Samui can expect the highly personal service, spacious and modern pool villas, and award-winning spa facilities that are the hallmarks of the Banyan Tree brand. The resort is offering an introductory rate under its Unbeatable Thailand promotion, which starts at THB18,200+++ (approximately US$566+++) per night, inclusive of daily breakfast, for two people in a Garden Pool Villa with a minimum two-night booking at Best Available Rate. Guests will receive hotel credits equivalent to the second night’s room rate (excluding taxes and service charges) – a minimum of THB 18,200 – to use on dining occasions, spa treatments and retail purchases within the hotel. The promotion is valid for reservation from now to 29 September 2010, and stays from now to 30 September 2010. Combining the best elements of a tropical getaway, Banyan Tree Samui offers large infinity pools in its villas, and the only hydrotherapy spa – The Rainforest – in Koh Samui, tightly clustered on a private hill cove within Lamai Beach, overlooking the deep blue swells of the Gulf of Thailand. The resort is a brief 30-minute drive from Samui International Airport. Exclusively designed by Banyan Tree’s in-house Architrave team, each of the 78 spacious pool villas measures from 130 square metres (sqm), providing an intimate escape designed for the discerning guest. The individual pools in the villas are amongst the largest for a hotel on Koh Samui measuring 35sqm, and invitingly accessible from the living room and the bedroom in true holiday style. Interesting architectural features include rotated square columns inspired by an old temple design, and the use of coconut palms and coconut shells as materials, to evoke the sense of old Samui, which was based on its coconut industry. Soothing earth tone shades and local artwork combine to further accentuate the feeling of a tropical home away from home. Guests enjoy the best of all worlds, whether they choose a Beachfront Pool Villa within easy distance of the inviting white sand beach, a family-ready Spa Pool Villa with an in-villa treatment room, or a Royal Banyan Pool Villa on the highest ridges with incomparable views of sunset and sunrise. The one and only Sanctuary Pool Villa combines two pool villas and is suitable for two families with over 316sqm of space. Dining on Koh Samui has never been better, with three new stunning restaurants at Banyan Tree: the beachside Sands restaurant, as well as two cliff-hugging outlets, The Edge and Saffron. Banyan Tree’s signature Saffron restaurant, perched on the highest point of the resort, features three private dining rooms for exclusive groups of 10 each, as well as an elegant wine cellar for sophisticated events. Its cuisine is modern Southeast Asian, with emphasis on authentic, rich Thai flavours. The Edge offers Asian and international cuisine with a sweeping view of the bay, imbuing each moment with additional memories. Located on the beach, Sands is the ideal spot to enjoy the sun and waves, where guests tuck into char-grill and wood-fired dishes of local seafood and gourmet selection of steak and pizza. Dinner of the Legend: Samui Episode is the destination dining experience, located exclusively for one couple each night on the soft sand beach, where a degustation dinner of fresh local seafood takes place over candlelight and starlight, accompanied by live instrumental music. Koh Samui also welcomes its first Banyan Tree Spa, and hydrotherapy facility, The Rainforest. The Rainforest is designed as a hydrothermal circuit, comprising alternating hot and cold thermal cabins, for couples to embark on a trail of wellness treats. Walk through The Rainforest Trail, offering different hydrothermal therapy experiences such as Rain Walk, Steam, Rasul, Sauna, Bucket Drench Shower, Ice Fountain, Swiss Shower and Vitality Pool. Spa-goers will also look forward to signature treatments delivered by professional spa therapists, trained at the exclusive Banyan Tree Spa Academy in Phuket, Thailand. Holistic Asian-inspired spa experiences are delivered in 10 spacious indoor spa pavilions with beach views. Thanks to pristine beaches, sapphire waters, mountainous hinterland and the ever-present silhouette of coconut trees, Koh Samui has emerged as one of the world’s most charming tropical islands. Samui (“koh” means “island” in Thai), located in the province of Surat Thani, to the south of Bangkok, is Thailand’s third largest island, sheltered in the shimmering bay of the Gulf of Thailand. This once-rustic Coconut Island is accessible by plane via airports in major Asian cities, but still hangs on to pockets of village-like ways of life. Banyan Tree Samui’s location off Lamai beach places it in the second-largest beach on the island, yet in a private bay of its own. Nearby attractions include Hin Ta Hin Yai, a humourously risqué-shaped pair of rocks named ‘grandfather-grandmother’ in Thai; Lamai temple, the main gathering point for religious and community activity, which has a Cultural Hall featuring Samui’s trading past, with artefacts such as brass and earthernware vessels; and the commercial stretch of Lamai beach with its bustling tourist activity. For reservations, please contact Banyan Tree Samui at Tel: +66 77 915 333, Email: reservations-samui@banyantree.com or log on to banyantree.com.